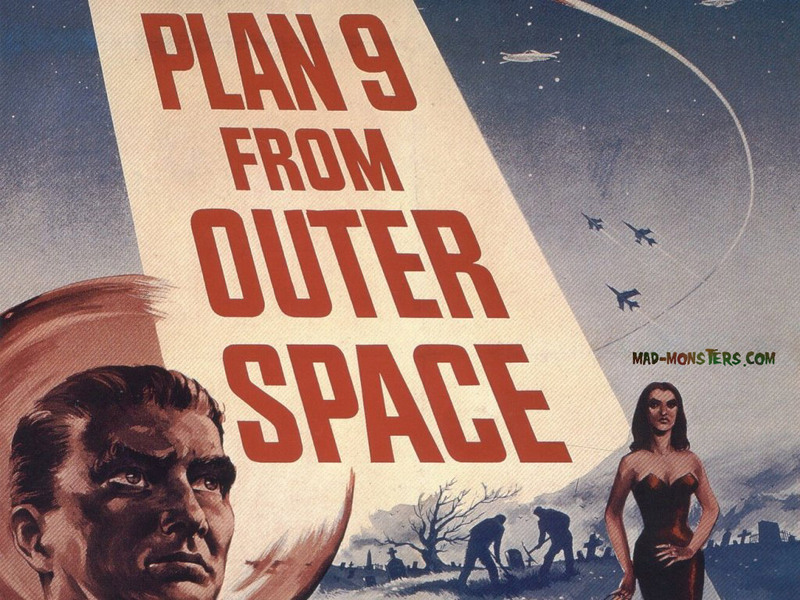 Ed Wood's Plan 9 From Outer Space: "The Worst Movie Ever Made,” "The Ultimate Cult Flick,” or Both? | Open Culture Ed Wood's Plan 9 From Outer Space: "The Worst Movie Ever Made,” "The Ultimate Cult Flick,” or Both? I had an adolescent fascination with Ed Wood. I mean that literally: I spent a sizable chunk of my adolescence watching the films of, reading about, and even reading the books by writer-director (and occasional cross-dresser) Edward D. Wood Jr. What, I asked, could have driven the man to make, and keep on making, the films that would ultimately define the category, quite popular during my teen years, of "so bad it's good" cinema? None of his numerous, all unabashedly low-budget pictures have done more for that form than 1959's Plan 9 from Outer Space, a breathless, nearly budgetless tale in which Wood throws together aliens, zombies, looming nuclear annihilation, and Bela Lugosi. Well, he almost throws in Bela Lugosi: as depicted in Tim Burton's 1994 biopic Ed Wood, he characteristically spliced in existing footage of the by-then deceased icon of horror film, cast his wife's chiropractor (instructed to hold a cape over his face) as a double, billed Lugosi as the star, and hoped for the best. You can watch the fruit of that and other highly unorthodox filmmaking efforts on the part of Wood and his faithful bunch of long-suffering collaborators at the top of the post. Just below, we have a clip from Ed Wood, which in large part deals with how its indefatigable protagonist, played by a wholesomely gung-ho Johnny Depp, came to make Plan 9 in the first place. This montage recreates the shooting of sequences Wood's fans will have long since burned into their visual memory: George "The Animal" Steele as Swedish ex-wrestler Tor Johnson rising ineptly from the grave, Bill Murray as would-be transsexual Bunny Breckenridge affectlessly giving his henchman orders to execute the title plan, a trio of toy flying saucers lowered on fishing wire into a model Hollywood. In 1980, Michael and Harry Medved dubbed Plan 9 "worst movie ever made," initiating its ascent from decades of obscurity to the status of, as John Wirt puts it, "the ultimate cult flick." Critics tend to regard Ed Wood as a "good" movie, and Wood's projects, especially Plan 9, as "bad" movies, yet both entertain at very high levels indeed, making us ask an important question, another one I asked myself in the thick of my Wood period: what makes a movie "good" or "bad," anyway? Plan 9 from Outer Space can always be found in our collection, 1,150 Free Movies Online: Great Classics, Indies, Noir, Westerns, etc.. This Summer I will be taking a stage production of ‘Plan 9 from Outer Space’ to the Edinburgh Fringe Festival with an even lower budget. @Alex Perry: you’ve forgot to keep us posted ;-), how did go with your production? We had a grand time at last year’s Fringe.